There is a lot of focus on stigma and diabetes. The focus around stigma and diabetes is usually in regards to what diabetes looks like as well as placing blame on the person living with diabetes. The issue is that we do not have a clear reason for the cause of diabetes, especially in the type 1 population. While some type 2 patients have clear reasoning towards their diagnosis, many type 1's are left feeling a disconnect because some of us living with type 1 have had no genetic reasonings and were diagnosed at an age where little to nothing could have affected their health. There is incredible stigma around those living with diabetes and those that are at risk for diabetes. Society loves to joke about diabetes and I have talked about this before. The problem isn't the jokes, the problem is the miscommunication. You cannot define what a cancer patient looks like, and you cannot define what a person living with diabetes looks like. 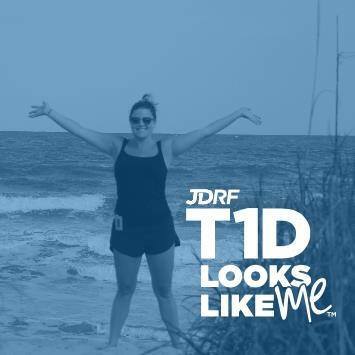 JDRF launched a campaign called, T1D Looks Like Me and I think it's a wonderful way to showcase those living with diabetes, although I know there have been people exposing what t1d looks like for years - so not a new idea. But, nonetheless it took off and many people were turning their Facebook into a great campaign to highlight how diverse type 1 diabetes is. This type of effort can help break the stigma of those living with diabetes, unfortunately more-so for those that are living with type 1 diabetes not type 2 (a population that could use a boost of support, in my opinion). While that JDRF campaign highlights how we all physically do not look alike, it doesn't really highlight how we got where we are today. A lot of people are quick to ask how I got diabetes, and to be honest, I have no idea. No one told me, and I've never asked. I know in my genealogy there were two type 1's in the family, and because I know of the nature of type 1, I know that I didn't physically do anything to cause my diabetes. But, oh the remarks, people love to point a finger. I think the diabetes community is doing a very good job at making sure all are felt comfortable and connected within the diabetes community, but we need to do more to expand that knowledge beyond us, so that no one feels the stigma of diabetes. [stig-muh-tuh, stig-mah-tuh, -mat-uh] (Show IPA), stigmas.